I think this is one of the more conservative outfits I've worn in a while. Conservative, in that the parts are pretty basic - black sweater, knee length skirt, black tights and "girl shoes"; no 80's shoulder pads, crazy prints, vintage leather, or clunky boots. The bright colours of the skirt had enough "POW!" that basic black seemed to be the best frame for it. The skirt came from fellow blogger, Curtise, who decided that since she didn't wear it very often, and I had admired it when she wore it on her blog, that she would pass it on to me. It fit perfectly, the colours are wonderful (the back panel is yellow), and the pleats held up even after 8 hours of sitting at my desk. I had more compliments from co-workers on this skirt than I've had on any other item of clothing I've worn in recent memory - it must be the happy colours. 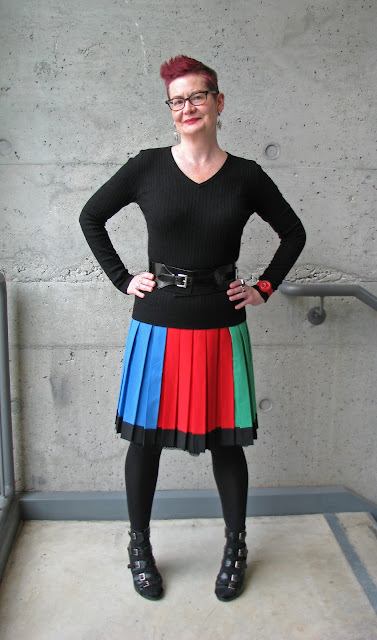 Two people pointed out that the colours of the skirt are the exact colours of the GOOGLE logo. Thus, the skirt has been christened "The Google Skirt". Thank you so much Curtise! I was contacted by Readers.com, to ask if I would style an outfit around a pair of their reading glasses to be featured, along with some other bloggers, on their recently revamped website. In the post, which appears on the Readers.com blog here, I am in the company of Patti of Not Dead Yet Style and two other bloggers I was not familiar with. Apparently I was the only blogger greedy enough to ask for two pairs of glasses, but what the heck, I couldn't decide between the colourful Elton frame which I'm wearing in the photo above, or the larger Architect, which conjured up visions of Iris Apfel. Unfortunately, my eyesight is so bad I am well past the "reading glasses" stage so I couldn't see a damn thing while doing the photo shoot. Thank goodness for my friend Heather, who took the photos and made sure I didn't fall over anything. Loving your hair styling and purple color in the first pics-- you look amazing. That skirt has a very nice graphic/bold look to it and looks great with the black. I'm blind as a bat and can't see a thing w/o my glasses or contacts. Love the sweater in the last pic. I love your styling on the skirt. Ooh, I love that skirt - so amazing! I would like to see a twirl! That skirt looks absolutely incredible, the primary colours and pleats just rock and I love those boots! 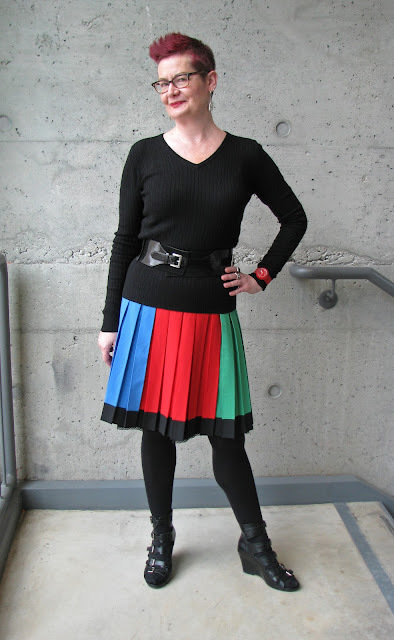 that pleated skirt is really awesome, love bold graphic colors and how you've styled them!, you're gorgeous! And both glasses are so cute I understand you couldn't decide between them!. Your outfits wearing them are really fabulous, love your hats and great style, and that Iris Apfel vibe is awesome!! Oh! i love that skirt Shelley! nice! Nice of Curtise to have sent it to you! Hey, good to see you rocking that skirt, Shelley, and getting compliments into the bargain! You must have narrower hips than me, it looks more streamlined on you and hangs better. Isn't it nice when clothes find their rightful owners?! There is a full length photo on the Readers.com blog of my outfit with the purple readers. I'm crouching, but you can still see the rest of my outfit. 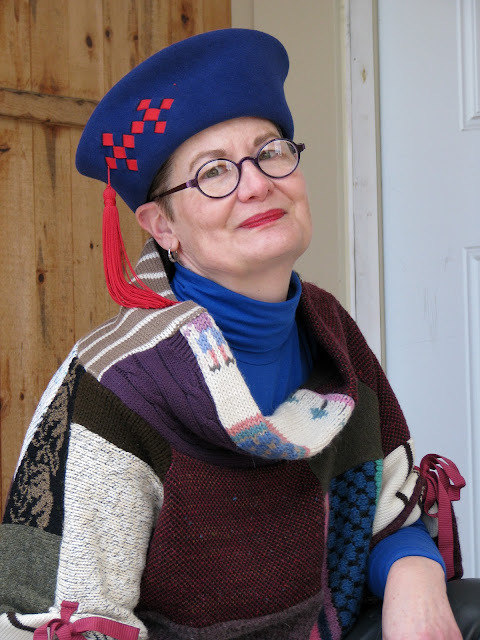 I purchased the hat from The Style Crone, and I've had the sweater for a while, but I don't think it's been on my blog. The skirt is so cool - bright and cheery and swingy - and it looks so cool with the belt and those fabulous shoes! I love red, blue and green together (and I'm sure yellow fits right in). I really like those round frames on you. Do you get to keep them? I've always wanted to have more than one pair to wear at a time, but I never do it. Once I get new ones, the old ones feel so boring. But getting two new frames at the same time would be ridiculously fun! I love the skirt...although it reminds me of a dress I had in high school that I HATED....It was a red, white and blue color blocked sleeveless, full-skirted thing that we had to buy at Sear's for $9.00 to wear for a modern dance performance I was in. My mother said "That dress is TOO expensive. You WILL wear it again". Imagine! Not what I wanted to wear in my teased hair, black tight skirt, black "boot shoes" phase. I think your shoe straps compliment the lines of the pleats nicely. And as to being blind as a bat....so am I. Don't you love it when you go to the hairdresser and are at his/her mercy because you can't see what the heck they are doing to you? And when he (in my case) asks "Are those bangs short enough?" I have to say "Wait, I have to put on my glasses." Then I'm very often disappointed at the cut, so what difference does it make if the bangs are long enough or not? Trust me you look wonderful. I LOVE that skirt; it's a bang of colour and style. Curtise - what a wonderwoman to match the two of you up. No wonder you got so many compliments. You've added simple pieces but the overall impact is huge. Niiice. And I love that you are model! You are covergirl material in those specs, but I can't help notice all the other spectacular styling you've done with the hat, sweater, etc. Um, a pity that you couldn't see in your glasses, but neither could Marilyn Monroe in How to Marry a Millionaire. Yeah, rocking that skirt, lovely!!! It's got a bit of a cheerleader feel about it, that skirt. It's rather fabulous, and I'm just waiting for you to bash me in the eye with a pompom!!! Perfect with black to show off the bold primary colours. hi, nice to meet you. I think we would get along following each other. So I am your newest #207. I too and into photography and fashion. I think I do better at fashion. I have to take my own photos cuz my HM has weird close up vision and cameras wig-out his eyes. I just use an incredible SONY point and shoot so I consider my photo skills a novice at best. Have a fabulous weekend! I get the biggest kick out of your blog. We couldn't be more diffirent ( I'd be eligible for Advanced Style if I had more style) and conservative (boring) in my choice of clothing. I'm trying to do better; you and Megan Mae, etc. have turned me on to the fun in being ever so slightly out there. Thanks, you wonderful woman! Nice to meet you dear blogger! I found you on Advanced Style and I loved here!!! Follow you....if you like me, I hope you on my blog and I hope that you liked!!! The gift from Curtise is perfect on you and you do the hat justice! Two outfits that look spectacular on you! No wonder you're receiving compliments from friends and receiving modeling requests from reading glass companies. Red and blue suit you! That skirt is FABULOUS! Love it so hard. I LOVE the google skirt! I have a similar item that I've never worn - I might try your technique of letting the skirt speak for itself. You are always such an inspiration, Shelley. Absolutely loved your fashion shoot with two totally different looks for the two styles of eyeglasses. Well done and very entertaining. Kudos! Love the colors !!!! Try out trendy colorful reading glasses to match the outfit.